Protect your equipment from the weather or organize it with our line of sun shades and panels. They shade unsheltered equipment such as Flow Measurement devices and uncovered electronics from wind, rain, snow, debris, and sun damage. 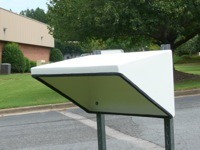 They also provide shade for viewing monitors to eliminate glare. Similar to sun shades, Tracom also has a line of panel shades. Panel shades keep the elements from monitoring devices. They also provide a dry environment for using any enclosured device without harm to the electronics out in the field. Molded reinforced fiberglass polyester containing: 30% Glass (by weight) in a General Purpose Polyester Resin matrix. Standard color: Pure White. For more information, visit TRACOM’s Shade Webpage or download TRACOM’s Shades Brochure.